Home / Time Travel / Did Time Travelers Sink the Titanic? Oh, sure, just take your camera and hop into a time machine and go snap photos of bridges or play jokes on Stephen Hawking by not showing up at his fancy time travelers’ party. That’s just rude. Even celebrities are in on the action, not giving a single nevermind to twisting the spacetime continuum into an infinite knot. But I digress. A few days ago, I was listening to an archived episode of Neil deGrasse Tyson’s podcast Star Talk Radio. The topic was, you guessed it, Time Travel. Now, I don’t remember too much about it, but I do remember one thing: Dr. Tyson mentioned a weird “rumor” he’d heard, about how the Titanic didn’t hit an iceberg. It was sunk by time travelers. Now, I thought, no, that can’t be a real theory. No one believes that, and time travelers wouldn’t be that stupid, anyway. So I do what I do and jump on the Internet and browse around. And there it is. 1. The Titanic never hit the iceberg. In the initial timeline, of course, it did. 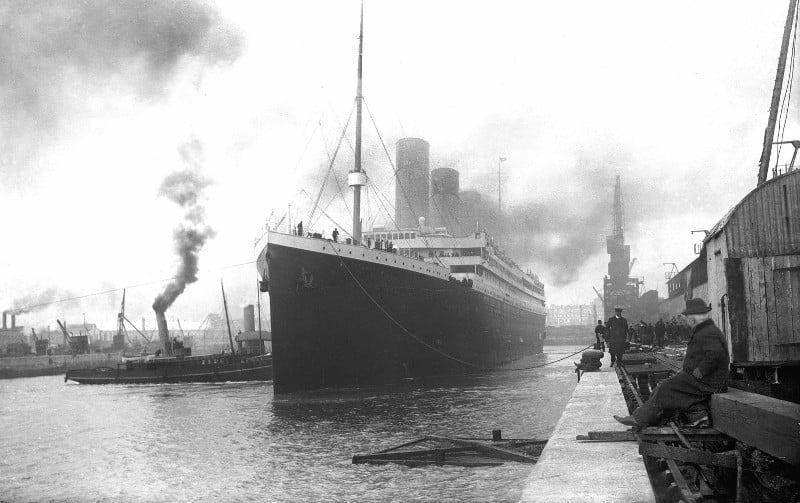 However, when time travel was (is, will be) invented, everyone wanted to travel back in time to see the iceberg that sank the Titanic. So many time travelers showed up that their collective weight was too much for the ship to handle, and that’s why it actually sank. 2. The second version is essentially the same, only the time travelers weren’t tourists, but covert operatives (hired by J.P. Morgan, I guess?) sent back in time to sabotage the Titanic. Hey, I never said these theories were likely. I just said they existed. I’m voting for theory #1, though, just for the record. Because yes, time travelers really are that stupid. Was Jack Dawson A Time Traveler? I found this on Reddit. Thanks Reddit. It checks out. So from this point on, I shall forever view the film Titanic as a psychological time travel thriller, prequel to The Terminator, tie-in to Doctor Who. Why not. 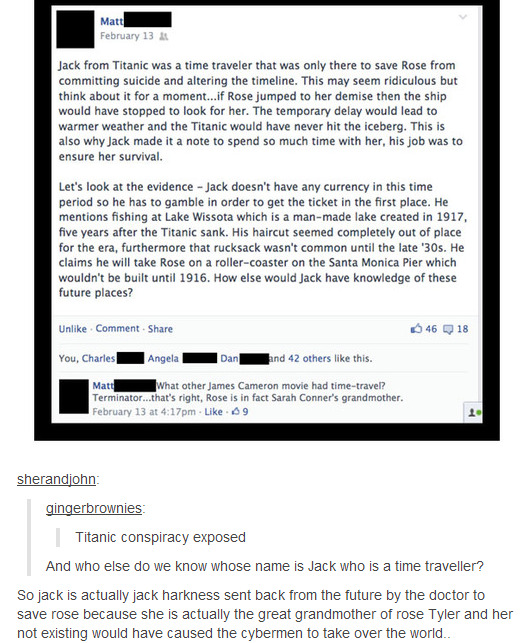 Well, that’s about it for Titanic time travel escapades. It’s not a new idea; there are at least a handful of novels based around the concept of time travelers returning to the Titanic. Oh, and Titanic: Adventure Out Of Time, which I’d say is probably the best PC adventure game featuring a time traveling secret agent aboard the Titanic. Easily. But this isn’t just about the Titanic. It’s about where people would want to go if/when time travel is made possible, and how badly they’d ruin the universe when they got there. Where/when would you visit? Problem is that Jack Harkness would have probably been more interested in boinking Caledon Hockley than Rose. But I digress. If Jack Dawson was indeed a time traveler I wonder what the purpose of screwing Rose DeWitt Bukater in the back of a car might have been. Conspiracy activated! Jack had to knock her up to ensure he in fact exists in the far distant future to come back in time to save her and knock her up – and then he had to drown to fake his own death before he re-emerges some years later as The Great Gatsby. I’ve always thought it was odd that Jack mentioned Nickelodeon when he meets Rose at the staircase for dinner. Nickelodeon premiered in 1977 from what ive read, and back then it was called pinwheel. A Nickelodeon was an oldschool moving picture machine , you would put a nickle in and look into the viewer and it was like a flipbook moving picture. You must have had a really privileged life, to where time travel is more conceivable to you, than somebody being broke.